Artist, freelance writer, sustainable/green/frugal blogger, designer, slave to Ed the Devon Rex cat and aspiring beekeeper. Felt. 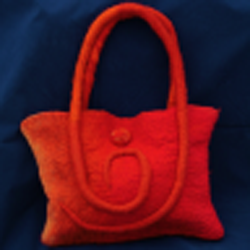 I create with both traditional felting and modern needle felting techniques. I adore the cozy feel of wool, the gorgeous colours, the nearly unlimited scope for creation and long, fleecy locks. Nothing saucy, sorry! A bedside table lamp and The Apothecary Rose, a Medieval Murder Mystery by Candace Robb. The work of Stephanie Metz is beyond amazing. One look at her work and you have no doubt that felt is a legitimate fine art medium. I'm also inspired by movie directors with a strong visual style- the Celtic flair of Peter Jackson, Guillermo del Toro's Steampunk aesthetic and the Gothic spirals of Tim Burton in particular. I often felt with a movie playing and I love to look up from my work to see a stunningly composed scene. I'm a huge reader, so books are an easy one. Film and directors. Self-sufficiency, DIY and green living. Plus wool and sheep breeds, of course. I'd love to learn more about natural dyeing techniques in one of eco-dyeing guru India Flint's retreats. The felting workshops of Pam de Groot in over in New South Wales always make me drool because she has such amazing style. I'd also love to meet up with other felters at this year's Southern Hemisphere Felting Convergence in Bunbury, WA, Australia. Actually, none of those are free, but if they were free to me, I'd definitely be there with felted slippers on. I taught myself to felt after having a stroke about 18 months ago when I was 36. I'm still recuperating and struggling with daily pain. Not only is felting my work, it is my therapy. My partner is very supportive and takes a good deal of delight in my more bizarre creations. Felt is so mutable, that weird screw-ups morph into something unexpected and often delightful-you don't even remember they didn't start out intentional. My red geode vessel started out as a hat in my head, but the felt had other ideas. Neither. I have dedicated areas to store my wool, but since a lot of my work is wet and soapy, I spend hours at the kitchen sink. When I'm needle felting, I tend to work in the recliner in our lounge. I'd love to have one of Ashford's Wild Drum Carders for mixing wool colours and other fibres with greater ease. I'm learning to hand card now and it is trickier than you'd think to do well. A big stack of commercial dyes and natural dyeing materials would be fabulous as I'd like to do more custom dyeing. More wool is always on my wish list, especially from long staple curly fleeced breeds like Lincoln Longwool and English Leicester sheep. Thanks Marie. And thanks NZ Handmade for featuring an interview with me! Love Melanie's blog, and it was a treat to learn more about her. Thanks! Great interview! I learned a lot about Melanie, whose blog I follow for her frugality and green tips. I really admire her work. 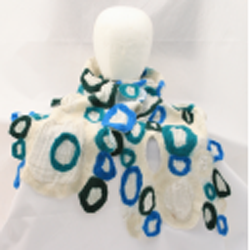 That she can create such works of art with wool by felting amazes to me. What's more, her bags, hats, and scarves are available online. Last year I ordered a hat for my daughter as a Christmas present. She loves it! Melanie McMinn's one of the most talented, creative bloggers around. So glad you featured her. I love seeing the new creations that Melanie comes up with. It's worth looking through the pics on her blog--the sphinx is so amazing. Great interview! Thanks for a great interview! I love Melanie's blog and continue to be amazed and awed by her ability to integrate art and writing and Kiwi life. Great interview Melanie! Your work is amazing... I've just been checking out your incredible sphinx!! I follow Melanie's work with awe. Such incredible creativity, and she shares all the fun with readers, too! creativity and a sense of humor -- those are two things I've always enjoyed about Melanie's blog. it's great to learn more about her and her work, thanks for featuring her. Thanks for the fun interview. Melanie's creativity, sense of humor and talent never ceases to amaze me! So great to see Melanie in the mix here. I've been following her blog for some time. Plus, that bag is just gorgeous.